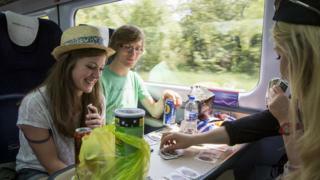 Over four million young people in the UK could be set to benefit from a new railcard for 26 to 30 year-olds. The website MoneySavingExpert (MSE) said it had seen documents from the Rail Delivery Group (RDG), which owns the National Rail brand, confirming a rollout of the card next year. The current 16-to-25 railcard offers discounts of up to a third off fares. MSE said that Greater Anglia was due to start trialling the scheme in the east of England in December. The company runs services in Cambridgeshire, Essex, Norfolk and Suffolk. However, neither the RDG nor Greater Anglia have commented on the plans. ''We can't comment on this at the moment, but we are always carrying out research and working with the train companies to develop new offers that make leisure travel easier, and better value for money," said a spokesperson for the RDG. Regulated rail fares are due to go up by 3.6% from January. MSE said it understood that 10,000 of the 26-to-30 railcards would initially be available to passengers in the Greater Anglia region, with more to follow next year. Why will train fares go up in January? And it pointed to what appeared to be an internal RDG memo to staff, circulated last month. The memo said the railcard plan "goes national in early 2018". The document suggested the card would be in digital form only and available via an app. "This is a trial. We still don't have full details and a national rollout hasn't yet been officially confirmed, so it's early days," said Steve Nowottny, news and features editor at MoneySavingExpert.com. "But on the face of it, this is great news for passengers who are a little too long in the tooth for the 16-25 Railcard. If the trial's successful, it'll mean you'll now be able to benefit from discounted fares until your 31st birthday." MSE said anyone who spent more than £90 a year on rail travel would benefit from having a railcard.